There may be a time in your life when you are unable to make your own financial or healthcare decisions because of extreme illness, disability, incompetence, or even on extended vacation. At these times, it is important that someone you trust is legally empowered to make these decisions on your behalf. You will need to choose your Attorney-in-Fact carefully and ask an attorney to prepare the POA so that your Attorney-in-Fact is empowered to do what (and not more than) you need them to. If you are planning to travel for an extended period of time, you might choose a trusted friend or family member to pay your bills and do your taxes while you are away. That kind of POA is specific and limited. A durable POA gives broad authority to the Attorney-in-Fact and retains its power even if, or especially if, you become ill or incompetent. A POA that is not durable becomes invalid just when you may need it most: when you become disabled or incompetent. A durable POA takes effect immediately. You do not need to be ill or incompetent for your Attorney-in-Fact to be able to make decisions for you. You might prefer a springing POA that gives authority to the Attorney-in-Fact only in the event of your illness. Sometimes it can be difficult to prove that you are ill enough or incompetent enough for the springing POA to be valid. If you really trust your chosen friend or family member, then it is a good idea to write a durable POA to avoid the delays and court costs involved in proving that you are ill or incompetent enough for a springing POA to be valid. What Makes a POA Valid? Be of sound mind when you sign the document. Sign the POA in the presence of at least 2 witnesses. It is a good idea to have a POA (durable or not) prepared by an attorney well ahead of the time it is needed. When a financial institution accepts a POA as valid, it is doing you a favor and taking a risk. If sizable financial transactions might take place, a financial institution does not want to worry that you are going to sue them later for honoring the POA. For this reason, it is important for an attorney to prepare the POA. The financial institution needs to feel confident that the POA is valid before it will accept its authority. What is an Advanced Medical Directive (AMD) or Healthcare POA? An AMD–sometimes called a Healthcare POA–gives authority to a healthcare “agent” or “proxy” to speak on your behalf in the event that you are unable to make your healthcare wishes clear. In addition to appointing a proxy, you write specific instructions for your healthcare providers in an AMD. You can (and should) choose a healthcare proxy and prepare an AMD when you are healthy. Strict rules vary by state concerning who can be your healthcare proxy and who can serve as witnesses to your AMD. In most states, neither your immediate family members nor the beneficiaries of your will can serve as proxies or witnesses. Your healthcare proxy should be given broad authority to make any decision that you would make if you were able. If you are at the hospital, the physicians and nurses will do all that they can to determine what your wishes are before they ask the healthcare proxy to speak on your behalf. The clearer your written directions, the easier it will be for your proxy to act on your behalf. A living will defines your wishes regarding the actions that can be taken to preserve your life when death is otherwise imminent. A living will is different from an Advanced Medical Directive because an AMD makes clear your healthcare wishes whether death is imminent or not. At times, life-sustaining treatment might be necessary even when your life is not immediately threatened, as in the case of a stable but persistent coma. In this case, a living will would be powerless because death is not imminent. Therefore, it is advisable to prepare an AMD, complete with directions for the healthcare providers, to address such a situation. BOOK: Powers of Attorney Simplified: The Ultimate Guide to Powers of Attorney- A helpful guide that also includes legal and state specific forms to further simplify the process. 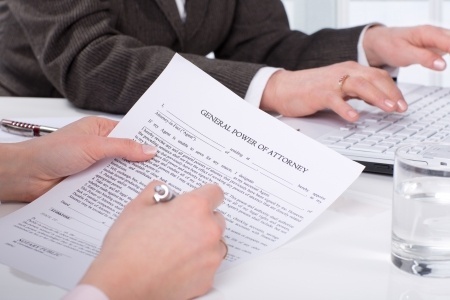 ARTICLE: Financial Powers of Attorney: Do You Need One? Nolo.com gives a clear outline of when and when not to rely on a durable power of attorney.